Sound art is having a resurgence. From podcasts, DJ sets and full LPs to production, radio slots and other collaborative endeavours, the direction and possibilities of this medium are seemingly endless. Online exhibition space ilyd are tapping into this area, with a focus on visual artists in particular to explore a broader understanding of the image. Launched in March 2016, and based between London and Copenhagen, visual artists Emilie Kjaer and Dyveke Bredsdorff are the curator-duo running the programme. Each month, a ‘visual’ artist is invited to produce a sound piece made solely to be hosted on the webpage, as well their Facebook and Instagram account. The 2017 spring season focuses on work by London based artists, including this months 12th participant Rosa Johan Uddoh whose work explores what she calls ‘maximum self-esteem’ through sound triptych ‘On Opacity’ (2017), as well as upcoming artists Hannah Regel, Luke Walker and Gray Wielebinski. Dyveke Bredsdorff talks to us about the project, its aims and the democratic potentials of the medium. Dyveke Bredsdorff: The project did not come about as an interest in sound art specifically, but I was listening to a lot of podcasts, and was interested in this space as a platform that felt democratic for sharing and availability. Working with writing as well, I was interested in this way that both sound and writing are able to create images inside the mind of others, and how uncontrollable it is. I was interested in how the distance between the audience and the work can be diminished and the artist can, in a way, be placed on the same side as the audience. I’m interested in how artists working visually, like performance, sculpture etcetera, could create images without any use of visuality at all. I was interested in how someone making sculpture would create non-visual sculptures. This led to the idea of creating an online platform that could be used as the podcast, where one can listen to it at home, commuting etcetera, with only the audio files available, as well as giving a context such as a short biography, nationality and which medias and interests they usually work in. ** Why do you think there is a resurgence in sound art? DB: I think it’s for the same reason that this wave of homemade podcasts started, or why a lot of artists write; it’s cheap and possible to do for yourself on a very basic level and at the same time it’s easy to share and reach an audience online. ** Do you see a difference between sound art and other forms of music, or are they becoming more intertwined? DB: I think there is a difference. Sound art can sometimes become very closely related to a scene surrounding electronic music, and that’s why we mainly invite artists whose practice doesn’t include sound, or at least primarily work in other medias. But not exclusively, because many artists have worked with sound in some sense. ** What motivated this project? Did you feel there was something missing, or alternatively, did you feel inspired by something? DB: I wanted to experiment with an alternative to the gallery space and see if visual artists could use the same space as podcasts for showing art. The online format makes it possible to create a space with very little means (not having to pay rent) and therefore can exist in places like London and Copenhagen, where it’s very difficult to run exhibition spaces. I would also like to have an influence on what kind of art scene I want be part of, and use the platform to invite underrepresented artists to participate. I think about the curator as a powerful role, and I want to use that to invite mainly (but not exclusively) female, non-binary, and queer artists. I want to use my position to think about class and race, inviting artists not only on the basis of their practices but also artists I think should be heard. In that way, I also see it as a political project. ** Who are some of your favourite contemporary sound artists? DB: I’ve been following this Danish sound artist Søs Gunver Ryberg. She made these sound works/electronic music AFTRYK based on field-recordings from inside the tunnels of Svalbard, which I find really overwhelming in the way the sounds work their way into your body, transforming physical material into sound. ** Will this project remain online, or do you have future plans for it to exist in other spaces in the future? 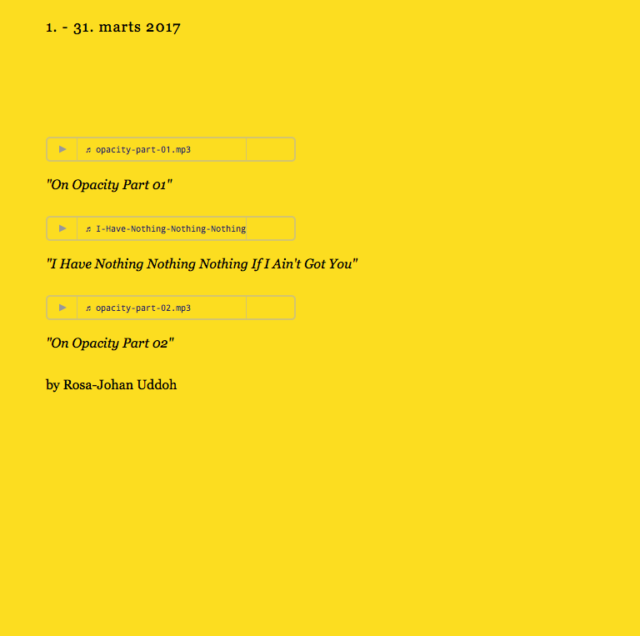 Rosa-Johan Uddoh’s On Opacity exhibition is online at ilyud, running March 1 to 31, 2017.